Now that Ford has decided to re-christen (rather than feed) the Five Hundred, it's no surprise that the Blue Oval Boyz are set to launch a new marketing campaign around its retro-monikers. In advance of that mind-boggling campaign, Ward's had a chin wag with the Cisco Kid (that's Cisco Codina, Ford's group vice president, North America Marketing, Sales and Service). 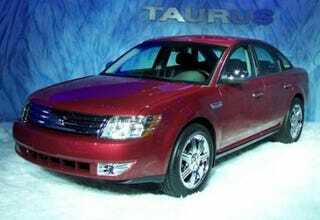 Mr. Codina stressed that bringing back the Taurus, Taurus X (nee Freestyle) and Sable (nee Montego) nameplates was not, as reported, CEO Alan Mulally's idea. "What Alan has done is create an environment all around the company, and people are willing to speak frankly and openly, and that's wonderful. So out of that, one of our guys from marketing said, 'What about bringing back Taurus?'" One? Which one? The Roll Call of Automotive Infamy needs a name dammit! Meanwhile, the Cisco Kid offered a piercing (if not exactly bold) glimpse into the glaringly obvious: "We have not put out a number yet, but I would expect sales to go up. Otherwise this (rebadging) was for nothing." Ya think?